The Student Sustainability Center (SSC) is a collaborative space for student-led initiatives that foster equity, environmental vitality, and economic well-being in the present and future. Through our efforts, we help students develop the skills, strategies, and networks necessary to work towards their vision of society. Emerald Earth Event: "We the Animals"
Sustainability encompasses a lot of topics beyond what you might automatically think about. We work on solutions to issues like food security, social justice, and yes, waste reduction. Our goal at the Student Sustainability Center is to connect you to all the ways you can help create a more sustainable UO, Eugene, and world. So how do you want to get involved? 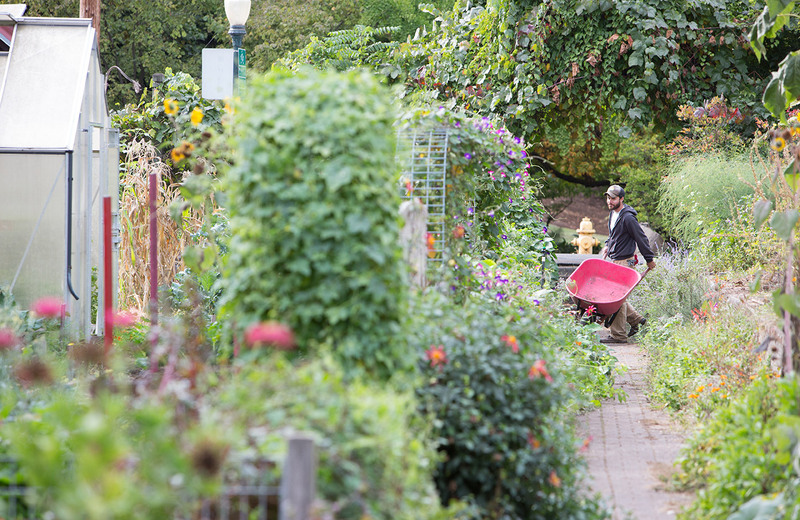 In partnership with the Urban Farm, the Grove Garden offers 24 plots, a free seed library, and volunteer opportunities. It helps address food insecurity and educates about the importance of pollinators. The waste reduction and reusables effort aims to reduce waste on campus. Our programs provide reusable water bottles, mugs, and silverware. We also host educational opportunities to fix broken objects. Studies suggest as many as half of U.S. college students experience food insecurity while in school. In an effort to reduce this educational barrier, the SSC provides free produce markets, help with SNAP enrollment, and more. Sustainability goes beyond just being green. Social and cultural equity is a vital part of a holistically sustainable society. The Student Sustainability Center advances this cause by focusing on social justice and equity. Pursue passion projects with the help of leaders in sustainability, get funding, spread the word through journalism, involve your fraternity or sorority, and more with these student organizations. The Student Sustainability Center hosts events to connect students with resources and opportunities. From the Sustainability Fair to Earth Week and Transportation Day, join us here. Earth Day Climate Street Fair 10:00 a.m.
April 22 10:00 a.m.–3:00 p.m.
Earth Day Climate Fair with student groups and off campus organization to promote sustainability. There will be workshops, art, giveaways, tabling by local organizations and student groups, and free lunch at 11:30 a.m.! UO Campus Talk: Speaking for the River with James Hillegas-Elting 4:00 p.m.
April 22 4:00 p.m.–5:00 p.m.
Blurb: Willamette River historian James Hillegas-Elting shares stories from his new book, Speaking for the River: Confronting Pollution on the Willamette, 1920s-1970s. The Willamette River is championed as one of the great national river clean-up success stories. Elting identifies key people and events that laid the foundation of both the Willamette River clean-up successes celebrated in the national press in the 1970s, and the continued challenges of the current era defined by big projects like superfund and citizen initiatives. The talk connects downstream ecosystem health with upstream conservation driven by nonprofit organizations, university faculty and students, and local government. Biography: James V. Hillegas-Elting is an historian of the 20th century urban environment in North America, specializing in the science, engineering, policy, and politics of the physical infrastructure that makes modern cities possible: transportation, sanitation, and energy.